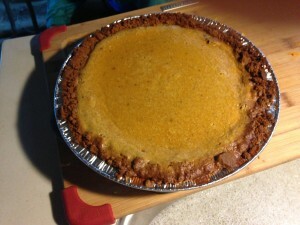 My fabulous pumpkin pie from scratch. Gingersnap crust kicks it up a notch!! 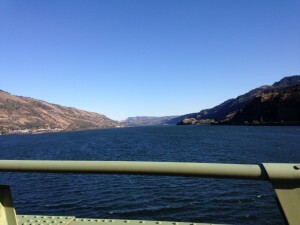 The Columbia River and the Gorge. 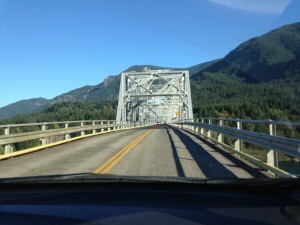 The bridge crossing over to Washington state. So much time has passed since we last chatted. Here’s a quick synopsis. 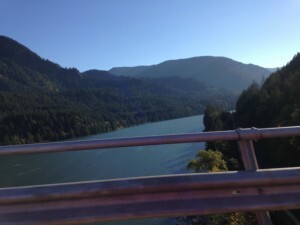 We have driven most of the neighborhoods of Portland. It’s quite a place. We have family and friends here and have been busy doing all things around the wedding which takes place TODAY!! How fortunate both the bride and groom are to have found each other. He from Barcelona. She from Portland. Now his family is here from Spain. Family is here from Chicago, Boston, Alaska. Turkey. OMG. Paris. The list goes on and on. Such a fabulous international event and this makes it super fun. Three nights ago, we went to the home of Ali and Bernat, the bride to be and groom to be and had soup and pumpkin carving. At that point the Turk and the Spaniards were all there. Language was a problem but not as much as you might imagine. A good time was had by all. The next night we went to a pub and had fish and chips and Guiness. All the family filled two huge tables and one booth too. 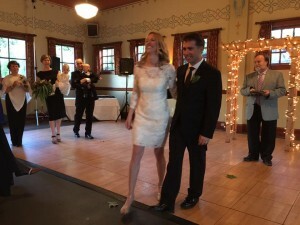 Last night the bride and groom hosted a party at a local McMinnimus hotel, Edgewood. The food, the wine was only surpassed by the attendees. After eating and drinking and working the room, a treasure hunt transpired. We were given two sheets of paper that asked us to locate things on the property. Here’s a link to the place so you can see what a daunting daring task this was. Click on on sight attractions to view the artwork. It is fab. “Where is the picture of the rabbit that doesn’t like loud music.” That sort of thing. Our team came in last. However, there were only 3 of us. Many teams had 5 or 6 members. We did great considering and it was a hoot racing up and down the halls of this enormous hotel looking for pictures and the color of lightbulbs and all things you might not otherwise notice. A great ice breaker too. Not that this un-shy group needed to break ice. And there you have it. We are on the way to the wedding. It has been raining all day but the sun just came out for nice respite. Rayman is heading out the door with Beau while it’s not raining. Oh, one other thing. I went with my cousin and her husband and their real estate agent to look at homes. Sue, my cousin, fell in love with the second house she saw and plans to make an offer on Monday. Gee. That was quick. But when you know it, you know it. And Sue is not one to be wishy washy. She knows her mind. And it’s on that house. Beautiful old house built long ago )1930s? I don’t know but it is quite old and completely up to date. Congrats to her and Larry. Ali and Bernat. Also on the left is her sister, Kristen with husband Cenk, their twins, Emre and Ezgi and to the far left is the groom’s mother. The wedding was yesterday and it was a blast. People from all over the world. Bermat, the groom, hales from Barcelona and much of his family came over. Some spoke english, some didn’t. Then there was the Turkish family members. Cenk, the father of Leyla and the twins and husband to Kristen (my cousin’s other daughter) flew in his mom and grandma for the month. There were young friends from Paris, family from Alaska, Boston, Chicago. More friends from London and Barcelona. Just so much fun to meet all these folks and celebrate. It was a joyous occasion. All of my cousin’s husband (Larry) family showed up. His brother from S.F., his sister from Boston. Very smart people with excellent educations. I also got to meet Forrest Dunbar who is a cousin one or twice removed on Larry’s side is an assemblyman in Alaska. Harvard and Yale educated. He may be headed places. Fun talking politics with him and his mom and dad (also in Alaska). My cousin, Marilyn, came. She is the Mormon. Got her up dancing!! It was just a blast. Dancing to Prince with a Mormon. Doesn’t get much better than that!!!! Plan now to avoid the coast going home. Too much rain and wind for our RV and for us. We leave on Tuesday. Depending on weather, we will be back home around the 24th or 25th. Yippee. I miss my house. It’s past time for a reunion!! Sounds like a fabulous series of events! Are you now in your way home? We are in Beanson til next Monday. Then we are Georgia bound. OMG McMennamins. We were there, with Flo. IEA conference. I took photos of all the doors etc. Loved them! Had a show at a gallery in Troutdale! Small world! Call when you are near home. Maybe we’ll cook you dinner! Hugh Laurie (House) starts on his new show (Chance) on Hulu tomorrow! Can’t wait! Sounds like it was a fab wedding. Pretty soon this might become home?